Is This The End of the Bongo Dynasty? King Mohammed VI of Morocco visits Gabonese President Ali Bongo Ondimba at the Mohammed V hospital in Rabat. 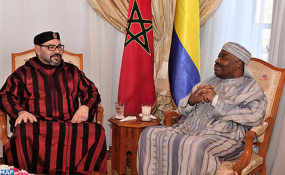 Rabat — HM King Mohammed VI paid, on Monday, a visit to president of the Gabonese Republic, H.E. Ali Bongo Ondimba, at the Mohammed V instruction military hospital of Rabat. During this visit, the sovereign was informed about the health status of H.E. Ali Bongo Ondimba who is staying in Morocco for rehabilitation and recovery. The meeting shows the excellent relations between the Kingdom of Morocco and the Gabonese Republic, marked by solid friendship and solidarity, and based on a deep and historical brotherhood between the two peoples and the two leaders.